What you'll learn today could rescue you financially over the next 12 to 36 months. Investors who don't know the facts, the history, the financial concepts, and the trading strategy I outline in today's essay have absolutely no chance of surviving the next few years without taking huge losses. This is the absolute best way to hedge your financial assets. This isn't just a speculation... It's also the best strategy to avoid big losses from what's about to happen. Even better – it's a chance to make between 10 to 20 times your money in the next year or two. Before the mid-2000s, U.S. corporations had never borrowed more than $1 trillion in a year. They did so twice, in 2006 and 2007 – the "boom" years. Maybe you'll remember what happened next – a huge bust, the worst recession since the Great Depression. First, he doubled the amount of outstanding, freely trading U.S. Treasury debt (from $7 trillion to $14 trillion). He directly borrowed more money than all the other U.S. presidents ever borrowed before, combined. Worse, his economic team led the Federal Reserve to hold down interest rates to essentially zero. What happened next will scar our economy for a decade, at least. Every year between 2010 and 2015, U.S. corporations borrowed more than $1 trillion. In 2014 and 2015, they borrowed nearly $1.5 trillion. Junk bonds had almost never made up more than 20% of corporate-bond issuance. But during the six-year "Obama debt boom" of 2010-2015, high-yield bonds made up more than 20% of issuance in every year except the last (2015). But it's not just that record amounts of debt have been underwritten. It's the quality of that debt that's the real problem. You see, most big banks and insurance companies aren't allowed to buy "junk" bonds. Therefore, most investors don't worry too much about the junk-bond default rate. But... what if investment-grade debt has suffered the same kind of quality impairment? Over the past decade, the lowest-quality tranche of investment-grade debt, debt rated "BBB," has grown from around 10% of total investment-grade issuance to more than 30%. While I don't think BBB debt will default at anything like junk-bond rates, I'm certain that during the next credit-default cycle, the annual default rate on the lowest rung of investment-grade debt will be at least triple its former peak (1% in 2002). If we see three or four years of default rates at this level (say 3%), you're going to see big losses at major financial institutions. These losses will be more than enough to cause the collapse of at least one or two big firms. (We're talking about $200 billion-$500 billion in investment-grade-bond defaults.) This will send a wave of panic through the markets. Combined with junk-bond losses, all this will dwarf the losses caused by bad mortgages. This big change in the underlying soundness of the corporate-bond market guarantees that during the next credit-default cycle, losses are going to be far bigger and hit far more companies and investors than ever before... and much more severely. Artificially low interest rates didn't just cause the corporate bond market to grow and decrease in quality. It also promoted a huge boom in subprime auto lending. 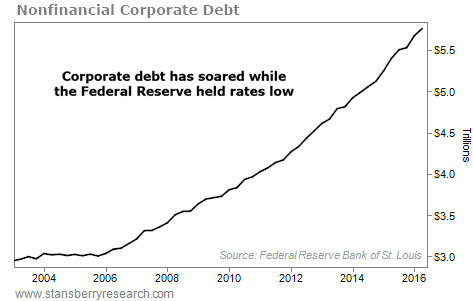 Normally... less than 5% of noninvestment-grade, U.S. corporate debt defaults in a year. But when the rate breaks above that threshold, it goes through a three- to four-year period of rising, peaking, and then normalizing defaults. This is the normal credit cycle... At the end of 2014, only 1.42% of speculative corporate debt had gone into default for the year – near a record low. We went on to predict that a new 2014 low for defaults pointed to 2016 as the year when corporate debt would begin a new default cycle. As you may know, the default rate on high-yield U.S. corporate bonds broke through the critical 5% threshold in August... just as we predicted it would. That kicked off a new credit-default cycle. We believe default rates will come close to 10% next year before rising to more than 15% in 2018. The impact of these rising defaults will be widespread and impossible to totally predict. But at least two things are sure to happen. First, you can count on volatility rising in the stock market as bankruptcy becomes more than a remote possibility for hundreds of companies. And second, the issuance of subprime debts – mortgages, cars, and junk bonds – will completely shut down. So... how can you trade this likely outcome? To profit from the collapse in subprime lending, I'd rather target the auto makers whose big debts and razor-thin margins put them at big risk from any decrease in sales value. We've already seen sales volumes falling (down about 8%) and moves to further reduce supplies. (General Motors is closing two plants and laying off 2,000 employees.) I'm certain we'll see more of both moves over the next year. Both Ford Motor (F) and General Motors (GM) have long-dated, out-of-the-money put options that trade frequently and have lots of volume. In plain English, that means you have a highly leveraged and liquid way to bet against the share prices of these companies. The details on how we'll trade these puts are beyond the scope of this essay. But for example... say you bought long-dated, out-of-the-money puts on Ford, using our strategy. For you to make money with this position, you'd have to expect that Ford's shares would fall 38% between now and 2018. Given Santander's enormous reduction in lending, that's a safe bet. But if panic spreads as defaults increase, and investors begin to doubt Ford's ability to refinance half of its $137 billion in outstanding debt over the next five years... Ford's share price could fall sharply, back down to its 2009 lows. Depending on which puts you buy, you could make almost 18 times your money on this trade. A lot of investors sit in the market, and they're terrified about what might happen next. They can't afford not to be invested. They need income. They need growth. They can't afford to miss what remains of this bull market. Most of these people don't think they can do anything about the risk of big drawdowns or even outright losses, like they suffered in 2002 and 2008. But that's just not the case. In 2002, we were up about 20% because we successfully shorted a bunch of stocks, including an airline that went to zero. We broke even in 2008, thanks to our shorts of Fannie Mae, Freddie Mac, and Capital One, among others. And we booked huge gains on the rebound in 2009. My point is, you don't have to be a victim of the market. You really don't. And you don't have to do anything radical like sell all of your stocks, or short the entire market. With Obama's debt legacy, you cannot afford to do nothing this time. Trust me, you can't. Earlier this week, Buffett's Berkshire Hathaway holding company released its quarterly 13F filing, which shows its investments from the previous three months. While he's still holding many of his longtime positions, he added an interesting position last quarter: airline stocks. 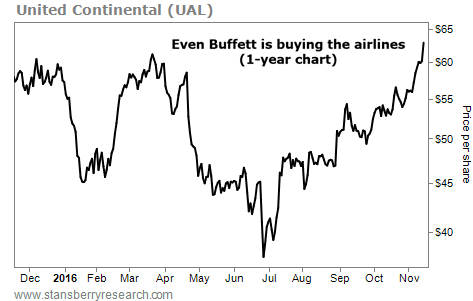 Buffett's thoughts on airlines are well-known. On a previous call, he stated: "If I get the urge to invest in airlines, I call an 800 number, and I say: 'Hello, my name is Warren, and I'm an air-o-holic. Sometimes, it takes them 10 minutes to talk me out of it, sometimes more." You see, airlines sport razor-thin margins... they're subjected to wild swings in fuel costs... and they require lots of capital expenditures to keep the business running. This makes them horrible long-term investments. But airlines go through big "boom and bust" cycles.